Here we will dicuss how to create a site using SharePoint Designer 2010. If you want to see how to create a Site collection using browser, then you can follow this URL. To start your create a site collection using SharePoint 2010 designer click on Start -> All Programs -> SharePoint -> MicroSoft SharePoint Designer 2010. This will open your SharePoint Designer 2010. 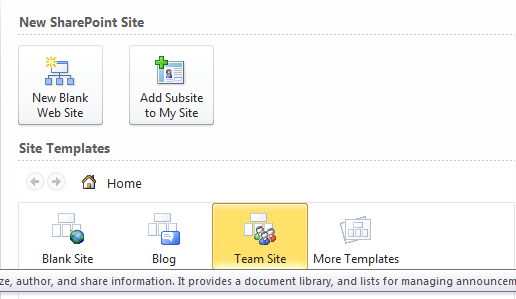 Then from the home page Look for the New SharePoint Site section and click on Team Site from the Site Template list as shown in the figure below. This will open the Team Site doalog box and there give the location of the new web site and click on OK as shown in the figure below. 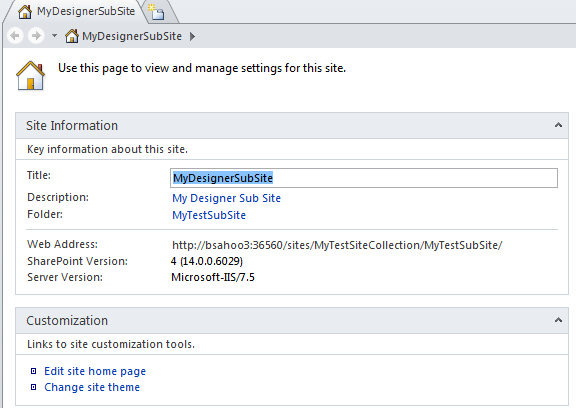 if you want to create a sub site to an existing site then open the Site collection in SharePoint Designer 2010 and then navigate to the Subsites section in the right hand site and click on New... as shown in the figure below. Then this will open your New dialogbox, where you can use the particular template for which type you want to make the web site, like you have to choose from the out of box template like team site, blank site, blog etc. Then you need to Specify the location of the new web site in the textbox and click on OK as Shown in the figure. This will create the Site and after that you can see the site in the browser with that particluar address. 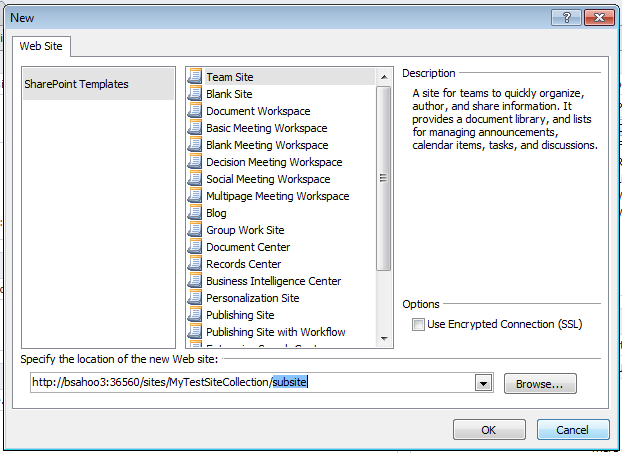 Here to remember one thing after you create the site or sub site, SharePoint designer 2010 will name the site as the name of the template like here it will name it as Team Site. To change the name, from the Home page in the SharePoint designer, from the Site Information section click on the Title and Description and change according to your need as show in the figure below. Diff b/w Application Pages and Site Pages????? Place An Image In Text With Photoshop.